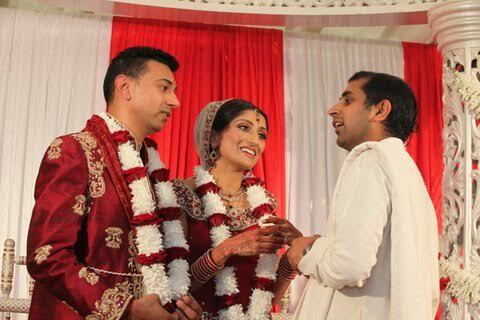 At its core, the Hindu wedding ceremony unites two individual souls spiritually, mentally and physically. The bond of matrimony is sacred and the ceremony is conducted according to Vedic Hindu traditions that are found in the pages of the ancient holy books known as the Vedas.Vedas, the most sacred scriptures of Hinduism, dates back some 5000 years. The Vedic wedding ceremony is therefore the oldest wedding ceremony in the world. It is also one of the most beautiful and uplifting to witness. For thousands of years, couples have made their lasting promises to each other in this traditional way. Although the rituals have been simplified considerably in modern times, Hindu culture attaches a deep significance to them. Each step of the Hindu wedding ceremony has a profound spiritual meaning and a life affirming purpose. The Hindu Marriage ceremony will be conducted in Sanskrit, one of the most ancient languages of the world, and is translated in a simplified way by the Hindu priest. Most of the Mantras (hymns) chanted by a Hindu Priest are taken from the Rig Veda, Yajur Veda and the Puranas. The brief description of each part of the Hindu wedding ceremony that follows will explain the meaning of the rituals. In the Hindu tradition, marriage is viewed as the second stage of the four stages of life. As well as being the union of two souls, it is also regarded as a bond between two families. Pokwanu/ Milini (Welcoming of the Groom) The bride's family formally greets the groom, his family and friends. The bride's mother applies tilak (red vermilion powder) on the groom's forehead, feeds him some sweet and offers him Arati (ceremonial worship), and finally asking him to step on to a clay pot breaking it into pieces, demonstrating that he has the power to overcome all the obstacles the couple may face in their married life. The groom is then escorted to the mandap (the bridal altar) where the Hindu marriage ceremony is held. Madhuparka During the Hindu wedding ceremony the groom is regarded as the personification of Vishnu, and the bride of Laxami, as a sign of respect, the groom's feet are washed, and in some traditions the bride's as well, and he is offered honey and milk. Kanya Aagman (Arrival of the Bride) Once receiving the signal from the Hindu Priest, the bride is led by her maternal uncle to the Mandap where a veil of cloth (Antarpat) is held in front of the groom to prevent him from seeing her. Whilst chanting the Vedic Mantras, the veil is removed. Jai Mala The couple acknowledge and greet each other by garlanding one another, witnessed by the Priest and all the guests present. The bride offers the first garland, and by doing so declares that she has chosen the groom at free will. The groom will return the compliment by offering her a garland in exchange, as a welcome to a new life and with a promise to look after her. As a mark of respect and courtesy, all the guest will be standing as the couple exchange garlands. The priest announces where, when and between whom the marriage is taking place. Kumbha Sthapana The Brahmin (priest) invites Lord Ganesha, (remover of all obstacles), and Brahma, Vishnu and Shiva, the trinity of Hinduism, and Nava-graha to bless and witness the ceremony. Hastamelap/Kanyadan (Giving away the Bride) The bride's parents express their wishes to give away their daughter in marriage. They give their daughter to the groom by placing her right hand in his right hand. The couple are advised to remember the Supreme Lord and look upon each other with love and compassion. The fire god is invited by lighting the small fire. The couple offers grains to Agni (Lord of Fire) symbolizing power and purity. The Priest will place Ghee (Purified butter) in the flames as he chants the Vedic wedding Mantras in Sanksrit. These prayers have a special importance, for it is Agni that dispels the darkness and ignorance from our lives and leads us to eternal light and knowledge. Two pieces of scarves are tied between the couple, the knot symbolising an unbreakable tie between them. Mangal phera (circumambulating the Holy Fire) The couple circle the holy fire, representing the basic goals of Hindu life: Dharma (religiosity), Artha (economic development), Kama (sense gratification) and Moksha (liberation from the material world). 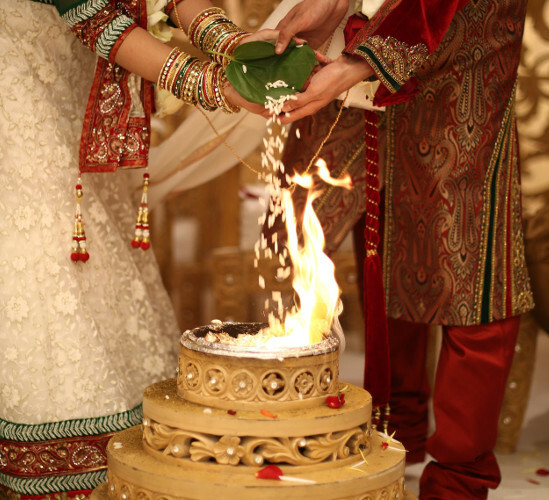 Each time the couple circles the fire, the bride's brothers or cousins give her puffed grains to offer into the flames. These represent the brother’s love for the sister. As a fun tradition, at the end of the last phera, the couple will run to sit down first. It is said that the one who finds a seat first will rule the house. Saptapadi (Seven Steps) The couple take seven steps to symbolize the beginning of their journey together for life. The groom helps the bride touch seven betel nuts with her right toe, while the priest recites the seven vows. As the couple take seven vows, they receive blessings from the priest and everyone present. Sindur Daana The groom places Sindur (red vermillion powder) on the bride's hair, symbolizing her as a married woman. Mangal Sutra Dharan Similar to the concept of the English wedding ring - a golden necklace is presented by the groom to the bride. The black beads signify protection from evil. It is believed to protect their marriage and their lives and represents the couple's togetherness, love and sacred union. The couple exchange sweets as a symbolic gesture that they will provide for each other's needs and prosperity in their household life. Aashirwad (Blessings) The priest recites Vedic Hindu weddinggrihanimi te saubhagya mantras offering blessings to the couple. He will ask the gathering to stand up as the parents shower the married couple with flowers and rice while giving blessings. The newly married couple will touch their families feet as a mark of respect and to receive blessings. Akhand Saubhagyavati (Blessings from Married Women) Invited married ladies greet the couple and whisper good wishes (luck, prosperity and happiness) in the bride's right ear). Vidai (Departure)	As the couple departs, the bride's family sees her off. The farewell to the bride by her family is emotional, filled with tears, sorrow and joy, as she leaves her parent's home to build a new life with her husband and his family.